Enjoy shopping during Friends & Family Event which is now available at OshKosh B'gosh store locations and OshKosh B'gosh online. You can save 25% off your entire purcahse! 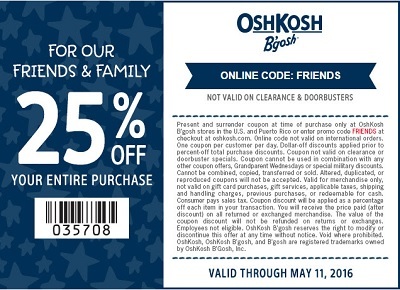 To receive the offer in-store print the coupon and present it at your nearest OshKosh B'gosh store location. To receive the offer online use promo code FRIENDS at checkout. Source of the information is OshKosh B'gosh. For more details visit your nearest store location. Offer expires May 11, 2016.